Each spring as Earth passes through the debris trail from Halley’s Comet (1P/Halley), the cosmic bits burn up in our atmosphere and result in the annual Eta Aquarid meteor shower. This year the peak will occur on May 6 about 9 AM EDT with meteor rates of about 30 meteors per hour near peak. Best viewing is just before dawn on May 6. Eta Aquarids zoom around the solar system at speeds near 148,000 mph. Unfortunately for meteor shower observing enthusiasts the moon will seriously hampered viewing of the ETAs this year. reducing the peak rate to under 20 meteors per hour. The Eta Aquarids are pieces of debris from Halley’s Comet, which is a well-known comet that is viewable from Earth approximately every 76 years. Also known as 1P/Halley, this comet was last viewable from Earth in 1986 and won’t be visible again until the middle of 2061. The annual Eta Aquarid meteor shower gets its name because the radiant — or direction of origin — of the meteors appears to come from the constellation Aquarius. To read more about fireballs, go to NASA All Sky Fireball Network. 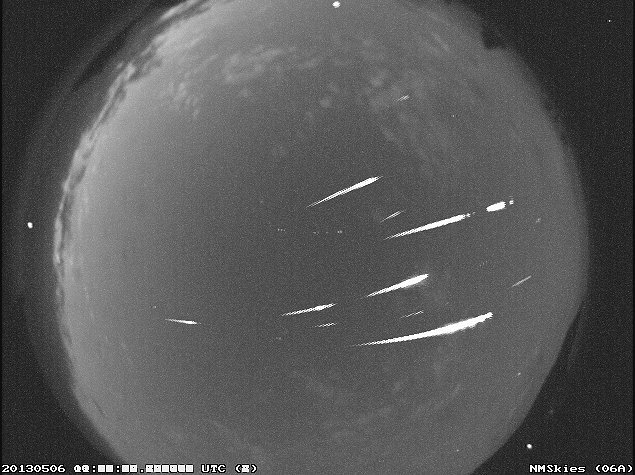 An image of an Eta Aquarid meteor from the NASA All Sky Fireball Network station in Tullahoma, Tennessee in May, 2013. That’s good I’m glad some body is keeping track of the stars so at least we wont be surprised at what falls from the sky, see chicken little wasn’t so dumb after all. Was wondering if the showers would be visible from sw Ms.